The dense fog last night caused low visibility at Sarai Rohilla, North district, which led to a collision of six vehicles in which three people were injured. A thick layer of fog enveloped the city this morning hitting rail traffic with 32 trains cancelled and 15 delayed. Air traffic, however, remained unaffected with just a five flights getting delayed. On the 5th anniversary of the Nithari serial killings today, no social or political group or even the relatives of Nithari victims reached the site to perform a 'hawan' ceremony as had been done till last year. Amongst its various pioneering projects, Delhi Metro has now constructed two underground substations in the Capital that will provide power to the high-speed Airport Metro Express Line. The Delhi Metro Rail Corporation plans to build nine more such substations that would facilitate power requirements in the upcoming ambitious phase-III project. A security guard travelling by a cycle was killed when a Delhi Transport Corporation (DTC) bus ran over him on Sikandra Road in New Delhi this morning. A 25-year-old student from Pakistan, who had been refused permission by Delhi University to appear in the third year exam, may have hope now with the department concerned reviewing the situation. The Municipal Corporation of Delhi (MCD) today sealed 26 properties and demolished portions of four structures as part of a drive against illegal constructions in the Capital. A 35-year-old security guard allegedly died in a fire that broke out due to short-circuit in a heater that was kept in his room at Defence Colony last night. The Delhi traffic police today said that on the New Year eve it had made arrangements for regulation of traffic and parking spaces by imposing restrictions in areas at and around Connaught Place. The Delhi traffic police will be deployed at several places to take strict action against drunken driving on the New Year eve by penalising motorists. The water supply to many parts of Delhi will remain affected towards the end of the year. The Delhi High Court has ruled that a Supreme Court-appointed committee was not empowered to stay the order of the New Delhi Municipal Council (NDMC) on eviction of squatters and upheld power of the civic agency to keep streets free for movement. With the arrest of three persons, including a proclaimed offender, the police today claimed to have solved five cases of robbery. A Delhi court has refused to divest a woman of the custody of her 11-year-old son and hand him over to her estranged husband, fearing he may make the child work in his shop like he has been doing with his minor daughter from his first marriage. A house owner in Ghaziabad shot a man he found trespassing in his compound in the early hours of Thursday, the police said, adding the dead man tuned out to be a neighbour. The year 2011 has ended on a good note for the staff of the Delhi Transport Corporation . A community centre in Jor Bagh, upgraded at the cost of Rs 2 crore, was today inaugurated by Delhi Chief Minister Sheila Dikshit. A Delhi police constable and his friend allegedly opened fire at a hotel here around midnight after consuming liquor, the police said here today. The police said that an autorickshaw driver lost control of the steering wheel and abruptly halted his vehicle in the middle of the road. In the low visibility, a couple of cars crashed into the rear of the autorickshaw, causing a massive pile-up. One of the injured called the police about 11 pm yesterday. The injured were then taken to a nearby hospital. In the pile-up was one autorickshaw, one Toyota Camery, a scooter and a Mahindra Champion. A case has been registered against the autorickshaw driver, Ajay Kumar Yadav. A two-year-old boy while playing outside his house was killed when a tempo ran over him at Rohini yesterday. The police said that the deceased, Himanshu (2) was run over by a tempo on the road in front of the Jaipur Golden Hospital situated at sector 3 in Rohini. "Himanshu was playing outside his home, when a speeding tempo ran over him about 3 pm," said a police official. Himanshu was taken to a nearby hospital, where he was declared brought dead. The police has arrested the tempo driver, Bhairon Singh. 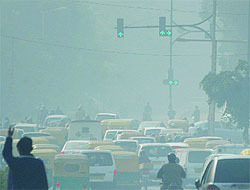 Visibility at 8.30 am was 200 m, said the India Meteorological Department (IMD). According to the northern railway officials, 32 trains were cancelled due to fog while 15 were running late by over an hour. "The weather in Delhi delayed five flights but there were no cancellations due to fog," said an airport authority official. However, 123 flights were delayed due to technical reasons or bad weather at destination. "Five flights were delayed due to bad weather at the Delhi airport and 123 due to operational and technical reasons of the airlines," he said. The minimum temperature was recorded a notch below average at 6.8° C and the maximum was set at 22.3°, which is two degrees above normal. For tomorrow, the IMD office said a light blanket of fog would cover the city throughout the day and would get dense in the evening. "The maximum temperature is expected to hover around 23° C and minimum around 7° C," the official said. Jhabbu Lal, father of victim Jyoti, who irons clothes, lighted candles outside the 'house of horror' D-5 and paid homage to his daughter. Media persons waited for the family members of other victims, but nobody came. After the recovery of skulls from the dry drain behind the D-5 house on December 29, 2006, the Noida police arrested the house owner businessman MS Pandher and his servant Surinder Koli. The CBI filed chargesheet in 16 cases. In four cases, the CBI court has given judgement and awarded death sentence to Surinder Koli. MS Pandher was awarded death sentence in one case. He then moved the High Court which has since acquitted him. In other cases, the trial is going on. The CBI court is closed due to winter vacation. On its opening, the pending trials will start. The victims' relatives say they do not want any public religious ceremony. They prayed for their loved ones at home. The victims' family members claim they get threats from Pandher's relations at court and feel unsafe. They say they have lost hope of getting justice. A majority of them have sold their plots received as relief and want to move on in life. Some of them say while nobody stops Anna or others from sitting on hunger strike, they were booked for attempt to suicide when they had sat on hunger strike for their demands. A social worker and a victim's father were booked for abetment to suicide. They have to go to court for the act till today. The two substations are constructed on an area of 5,000 sq km at Church Road near North Block and Rashtrapati Bhavan. These substations will soon feed the Central Secretariat-Badarpur line. "It is for the first time we are coming out with such a substation in the city. It has already started feeding the Airport Line and would provide power supply to the Central Secretariat-Badarpur Line from next month," said Delhi Metro Rail Corporation director (Electrical) Satish Kumar, speaking to the media today. "DMRC had to evolve a unique layout for two receiving substations, one for the Airport line and the other for Line 6 from Central Secretariat to Badarpur in Lutyens' zone. After several technical considerations, the location at Church Road near North Block and Rastrapati Bhavan was chosen whereby the two substations were combined. 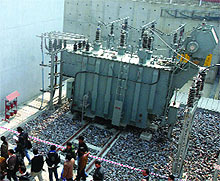 In compliance with local laws, the Central Vista Committee (CVC) desired that no part of the substation had to be above ground except the boundary wall. The top of the substation should be covered with greenery. For this purpose, the layout was specially evolved to comply with the requirements of CVC and available area," added a DMRC spokesperson. The top of the substations is maintained as park as per the provisions of local laws in Lutyens' zone that prohibited construction of the structures above the ground. Kumar said that the NDMC has also approached the DMRC to build such substations for it. "The building, housing the gas-insulated switchgear and control room, is seven and five meters respectively below the ground level with special ventilation arrangement. The transformer bay area is sunk by 6m below ground, though not covered and visible from the road. The top of the roof has been landscaped to present a green look. The area being rocky required digging in a controlled manner. Special arrangements have been made for earthing of equipment and drainage of water with the diesel generator as standby for power supply," said Kumar. A police official said that Ram Raj Kumar (30) was a security guard at Gol Market. He was working under an agency Top Security. "Ram was on his cycle and was heading towards Barakhamba Road via Sikandra Road. Around10 am, a DTC bus while trying to overtake the cycle, rammed into its side. Ram fell off and came under the rear tyer of the bus. He died on the spot," added the official. The driver, Devinder Kumar (30), was arrested from the place of the accident. A case under Sections 279 (rash driving or riding on a public way) and 304A (causing death by negligence) of the Indian Penal Code (IPC) was registered against him at the Barakhamba Road police station. He had driven the bus from the Indraprastha depot and was heading towards New Delhi railway station. Meanwhile, the body was taken to the Lady Hardinge Hospital for the postmortem. The university had earlier refused permission to Gagan, who is a resident of Swat province of Pakistan and a student of Germanic and Romance Studies, due to low attendance. According to official records, he could not attend classes because of poor health. The department is now considering some leniency in the matter even though he has had a "poor" attendance record for the last two years. Under the rules, the minimum attendance for a student to appear in examination is 66 per cent. However, even students with attendance between 40 and 66 per cent are allowed to sit for the exam after they sign an undertaking to make up for the absence in the next semester. Gagan's attendance is even lower than this. He took admission in the undergraduate French course at Delhi University in 2007. He appeared for the first year exam in 2008 and the second year in 2009. However, he had jaundice and could not appear for the exam in 2010. The dean of examination has meanwhile written to the department concerned, asking it to reconsider his case. The exception comes as Gagan's visa expires next year. Despite having submitted the medical certificate, Gagan had been approaching all the DU offices, seeking permission to sit for the examination. Sources in the Germanic department said that Gagan has managed to extend the visa till October next year. "It is not for the examination office to decide if a candidate may take an exam. If the college and the department do not have any objection, why should we have a problem? We have sent his file back to the department. He may still have some chance. His visa is to expire in October next year, and if not allowed to sit for the exam, he will waste five years and will not have a degree in hand," stated the office of the dean of examination. The action was carried out in Rohini and Najafgarh zones with the help of the local police. In the Rohini zone, 20 shops were sealed in Rajapur Village for misuse of residential properties while portions of four properties were demolished in Trinagar, Harsh Vihar and Saraswati Vihar. The incident occurred at C Block, Defence Colony about 10.30 pm yesterday. The police claimed that the deceased, Rakesh, was asleep in his room when the fire spread from the heater. Investigations by the police will ascertain the exact cause of the fire. Rakesh's body was charred beyond recognition. Later, he was identified by the police who saw his identity card lying in his room. Rakesh's family, including his wife and children, has been informed of his death. The restrictions will be imposed on December 31 from 7 pm onwards till the end of the celebrations of the New Year eve. It will applicable to both private and public transport vehicles. On this day, no vehicle will be allowed to proceed towards Connaught Place, beyond the roundabouts of Mandi House and Bengali Market, besides the north side of Ranjit Singh Flyover and the Minto Road-Deen Dayal Upadhaya Marg crossing. Traffic will not be permitted to move towards Connaught Place beyond Chelmsford Road near New Delhi railway station, RK Ashram Marg-Chitragupta Marg crossing and the roundabouts of Gole Market and GPO. The area leading to Connaught Place from Patel Chowk, Kasturba Gandhi Road-Ferozshah Road crossing and Jai Singh Road-Bangla Sahib lane will also be out of bounds for vehicles. The traffic police has also made another restriction of not allowing any vehicular movement in the inner, middle and outer circles of Connaught Place. Furthermore, there will be limited parking space on a first come first serve basis in Connaught Place. Motorists can park their vehicles at Kali Bari Marg, Pt Pant Marg, Bhai Veer Singh Marg near Gole Dak Khana. Parking lots will also be available at Rakab Ganj Road near Patel Chowk, Copernicus Marg near Mandi House and DD Upadhaya Marg near Minto Road. Residents would be permitted to enter the area after verification. They will need to carry papers to prove their identity and residence. The punishments for this crime are a fine of Rs 2,000, suspension of driving license, while some may be sentenced to a jail term. According to statistics of the traffic police up to December 15 this year, 16,691 drivers have been prosecuted for drunken driving. Out of this 2,869 motorists have been sentenced to jail. The license of 2,179 motorists has also been suspended. Joint Commissioner of Police (Traffic), Satyendra Garg said, "All motorists are advised to keep their speed within the limit applicable on the roads, to not indulge in racing and reckless driving. They are also requested to observe the traffic laws to ensure their safety and the safety of others." As the clear water channel of the third 40-MGD plant at the Wazirabad water works will undergo repair, water will be supplied at a low pressure on December 30 to some areas, including Jagatpur, Gopalpur, Mukherji Nagar, Gujranwala Town, Model Town, Nirankari Colony, Hakikat Nagar, Kingsway Camp, Azadpur, Jahangirpuri, Adarsh Nagar, Lowarance Road, Punjabi Bagh. Further, due to the annual flushing of the underground reservoirs, also on December 30, water will be supplied at a low pressure to Shanti Niketan, Sarai Basti DDA Flats, N-Block Saket, DDA Flats JJ Colony Madangir, Anand Vihar, AGCR Enclave, Patparganj Society, east and west Vinod Nagar and Gazipur, according to officials of the New Delhi Municipal Corporation. "Hawkers cannot be allowed to choke the streets. It is the NDMC which will decide how to maintain the streets," the court observed. Justice Rajiv Sahai Endlaw delivered the order on December 23 after the NDMC, which serves a bulk of central Delhi areas, challenged the order of the vending committee which restrained it from removing hawkers, squatters and vendors. The apex court had constituted the vending committee to regulate hawking, squatting and vending on streets. It comprises representatives of municipal authorities, traffic police, land-owning agencies, traders, resident welfare associations and association of street vendors. Justice Endlaw said the vending committee was only an administrative or recommendatory body tasked to identify vending sites and determine eligibility of hawkers. The vending committee was not entitled to adjudicate whether a person, who till now had not been found eligible under the policy for a vending site, be allowed to obstruct the street or whether the NDMC was entitled to remove him. "The committee or the appellate authority is not court. It is only the court which can be said to be enjoying power to issue interim orders/directions," the court said. Justice Endlaw said: "The observations in the orders of the Supreme Court that the said bodies were intended to provide a complete mechanism for redressal of all grievances of the hawkers, squatters and vendors cannot be read to be vesting the said bodies with the power of passing any interim orders." 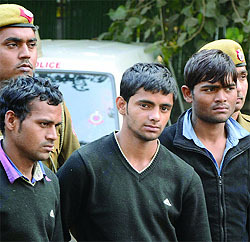 The accused have been identified as Pankaj (22), a proclaimed offender, Dharambir (24) and Shiv Kumar (22). They were arrested on December 26 from near Mother Dairy in the Sanjay Jheel area in south-west Delhi on a tip-off. Guardian Judge Gautam Manan denied the child's custody to the man saying he had not even provided any maintenance for the welfare of his son to his estranged wife, whom he had married after having a mutual divorce with his first wife. "The petitioner (man) had made his minor daughter (from the first marriage) to sit in his shop and this may be done in case the custody of the minor (son) is granted to him. This indeed will not be in the welfare of minor (son). "Petitioner has not provided any amount of maintenance to the respondent (wife) for taking care of the child. Not supporting the minor financially shows that the petitioner is not interested in the welfare of the child," the court said. The court, however, granted him the right to visit his son for two hours on fourth Sundays every month before a magistrate at Narnaul in Haryana where his wife lives and asked him to pay her Rs 300 per visit as conveyance charges. The court's order came on a petition filed by the man, a small cosmetic shop owner, seeking custody of his son. The man, in his plea, said he had married his wife in January 1999 at Narnaul and a baby boy was born in February the following year. The father said at the time of his second marriage, he was having a daughter from the first one. He said in February 1999, his wife started quarrelling with his mother without any reason and told him that she can not adjust in a joint family. He claimed even after the child's birth, his wife's attitude did not change and she became more aggressive towards him and his mother. He alleged that in 2006, his wife ran away from her matrimonial house without informing him. He told the court that his wife is living separately at her parental home since February 2006 and she had registered an FIR against him before the Crime Against Women Cell there. The wife, in her written statement in the court, denied all the allegations levelled against her by her husband and said his plea was liable to be dismissed. She deposed that her first husband had died in 1998 and when she had married the man, his daughter from the first marriage was around 13 years old. She told the judge that she was working in a school as a receptionist and her son was studying at a school in Narnaul. The court, in its order, said the minor child has been residing with her mother since birth and it would be difficult for him to adjust in the company of his father. The incident occurred in the Sikrod area, when Karamvir noticed a man walking in his courtyard around 4 am. He took out his licensed rifle and shot at the intruder, hitting him in the head. As the intruder collapsed, Karamvir informed the police, who reached the spot. The dead man was identified as Sanjay, 26, a neighbour of Karamvir. The police seized the rifle and took Karamvir and his younger brother into custody. "We are investigating the case from all angles.”circle officer Praveen Ranjan Singh said. Chief Minister Sheila Dikshit today indicated that she was in favour to regularise the services of the contractual employees in the DTC as they are not able to concentrate on their work due to their fear on continuity in the job. A tripartite meeting will be arranged in February to deliberate on all issues related to improvement in service conditions of the workers and their appointment as permanent employees in the DTC. It was announced by Dikshit at a meeting of the DTC Mazdoor Union here today. The DTC has decided to give Rs 16,000 per month to its drivers and Rs 12,000 to its conductors. Daily income of the DTC has gone up from Rs 70 lakh to Rs 3.25 crore. She stated that as far as possible the employees would be appointed on regular and permanent basis. "This will be done especially in case of drivers. There is a need of providing them the best training. The training courses may be repeated number of times to ensure that Delhi becomes an accident-free city," said Dikshit. She said that the government would look into the issues of the workers with a new sympathetic view point. "The government will also try to remove obstacles coming in the way of the workers and the DTC. The DTC service in rural parts will be improved with strengthening of the roads in the villages," she said. Dikshit said the DTC had to compete with Delhi Metro and attained the first position in public transport system. "It is possible for the DTC to attain this place as it can cater to the services of every nook and corner of the city. To increase its income, the DTC will have to curb ticket-less travel," she said. "The community centre was constructed in 1971-72. With the passage of time, there was a need to equip it with modern facilities," said Dikshit. The centre has been equipped with modern utilities like air-conditioner, fire-protection system and modern kitchen equipment. It has been designed to be eco-friendly and user-friendly. The total covered area at the ground floor is 660 sqm. It has a reception lounge, main hall, three rooms, kitchen and separate toilet blocks. The covered area at the first floor is 406 sqm and consists of three rooms. Ramps have been provided for making the centre accessible for the physically challenged persons. The toilet blocks at the ground and first floors have been renovated. Modifications have been made to the library, dispensary, dance and reading rooms, reception hall, entrance lobby and kitchen etc. The entrance lobby and corridors have been improved by providing granite floorings. Dance room has been given wooden flooring and vitrified tiles have been fixed in other rooms. NDMC chairman Archna Arora said silicon brick tiles had been fixed on the façade of the building and the door and windows had been replaced with aluminum frames, including toughened glass. The incident occurred when the hotel manager asked them to pay the bill. They duo tried to flee from the scene in their car, but Kavi Nagar Station House Officer (SHO) Avnish Gautam chased and arrested them. They also opened fire on the police in a bid to run away.